The Army Polo and Riding club conducted the Garcha Northern India Open Championships from 12th February to 17th February 2013 as part of the Delhi Spring Polo Season. 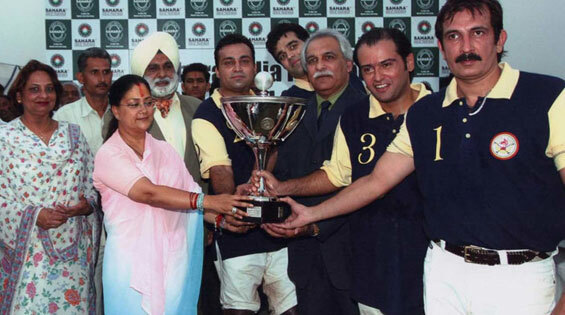 One of the most prestigious tournaments of India Polo Calendar, this is the only championship (other than the IPA Championship) which has been played consistently since its inception in 1922. Our Sponsor:- Mr. Satinder Garcha sponsored the prestigious event. Polo runs deep in Satinder Garcha’s veins, the son of retired Col. Kuldeep Singh Garcha, who was captain of India’s National Polo Team. Garcha Jnr. has taken to the sport like a duck to water; these days he boasts a very respectable 2 goal handicap for an amateur player. He has a passion for the sport that has seen him play and garner honours in low, medium and high goal tournaments around the world including captaining the National team of his adopted homeland Singapore to a silver medal at the Southeast Asian Games in 2007, and more recently this year winning the Copa Presidente in Argentina, the most hotly contested 20 goal tournament in the world beating out 68 teams to lift the trophy. Participants:- Four teams participated in the league out of them finalists were Elevation Team and the Sahara Team. The match was abandoned due to heavy rain on 16th February Hence; both the teams were declared as Joint winners. Exhibition Match:- In Lieu of the finalists an exhibition match was played instead. Teams participating Elevation vs. Hotels by Garcha. Elevation developments are designed by leading architects and interior designers. Located in the most exclusive residential areas of Singapore, homes by Elevation boast proximity to lush foliage of the Singapore Botanic Gardens. Hotels by Garcha are slated to become world class icons and paradigms of understated luxury in themselves. Hotels are soon to be launched located in Santiago, Chile, Singapore and other gateway cities around the world. Exhibition matches were held by Garcha Elevations.